Sodium metal is a soft silver-white metal that is highly reactive. The chemical is utilized for a number of different applications. Sodium is used as a reducing agent in chemical reactions. It is also used to react with alcohols to produce sodium alkoxides. Sodium can also be used as a heat exchange in some nuclear reactors, and as a reagent in the chemicals industry. The most common compound of sodium is sodium chloride. It is added to food and used to eliminate ice on roads in the winter. It is also used as a feedstock for the chemical industry. Sodium metal is flammable and can generate hydrogen gas which can spontaneously light on fire in the presence of acids and water. Larger blocks of sodium metal, however, slowly react and form a layer of inert oxides and hydroxides. Sodium metal must be safely handled with gloves for short periods of time out in the open. Due to moisture in the air, finely powdered sodium metal should never be handled in the open – exposure to moisture can both reduce the quality of the reagent as well as potentially cause dangerous fires. For compliant storage mechanical ventilation, vapor detection, as well as integral dry fire suppression systems must be implemented in chemical storage buildings. When storing sodium metal, it is recommended to utilize a safe chemical storage building that meets specific regulations. 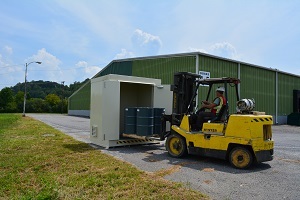 Flammable chemical storage buildings are designed to safely store flammable and combustible chemicals. Periodic Table, RSC.org. Sodium Metal Element Information. 2012. Matheson Gas. Material Safety Data Sheet. Sodium Metal. 2008.